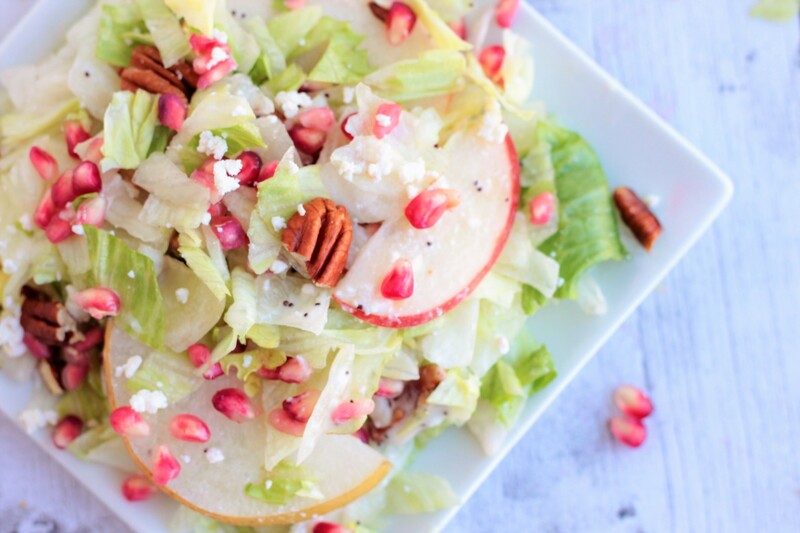 Enjoy the seasonal flavors of Apples, Pears, Pecans, and Pomegranates with this quick, easy and delicious Autumn Salad with a dash of Poppyseed Dressing. Yum Yum!!! Fall is almost around the corner and we can barely wait to enjoy the seasonal produce like apples, pears, pumpkins, the different varieties of squash and ofcourse corn. The one thing I see myself making often during fall is this Autumn Salad with Poppyseed Dressing. I admit it is my family’s favorite Autumn Salad. After a spell of summer fruits, we love the crisp and sweet apples and pears. They bring about just the right amount crispiness a salad should have. Add in some greens like buttercrunch lettuce and you are all set for the crisp and crunchy element of the salad. Throw in some pomegranate seeds, nothing like the pomegranate seeds bursting with sweet and sour juices in your mouth. Pecans add the scrumptious nutty taste and for a rich aroma and tangy flavor toss in some feta cheese. You could even add some cranberries if you like. The best way to dress up this Autumn Salad is with a tongue-tingling sweet and tangy Poppyseed Dressing that is easily available at Target. OMG!!! Can you imagine the medley of flavors? 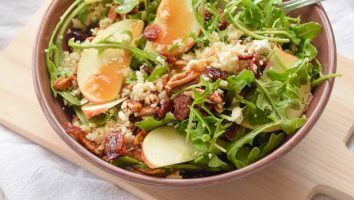 Not only do we love the flavors of this salad but we love how easy and quick this is to prepare. Especially for a party. It’s quick and easy and sure to wows your guests. There have been times where we were requested to make this salad for our block parties or potlucks. You cannot go wrong with this salad for sure. If you are making it for a party, you can even make it ahead of time. Make sure the apples and pears don’t go brown. We often soak them in lemon water to prevent browning. Always works and keeps the salad fresh and crisp maintaining it’s appeal. 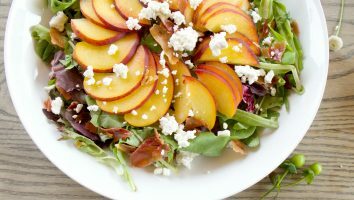 The next time you are hosting a Fall Party, don’t forget to wow your guests with this salad. Toss in all the dry ingredients in a large bowl except for the dressing. Mix the ingredients well. Drizzle the dressing and you are ready to serve. This looks so Delicious and refreshing!! Love the poppy seed dressing! 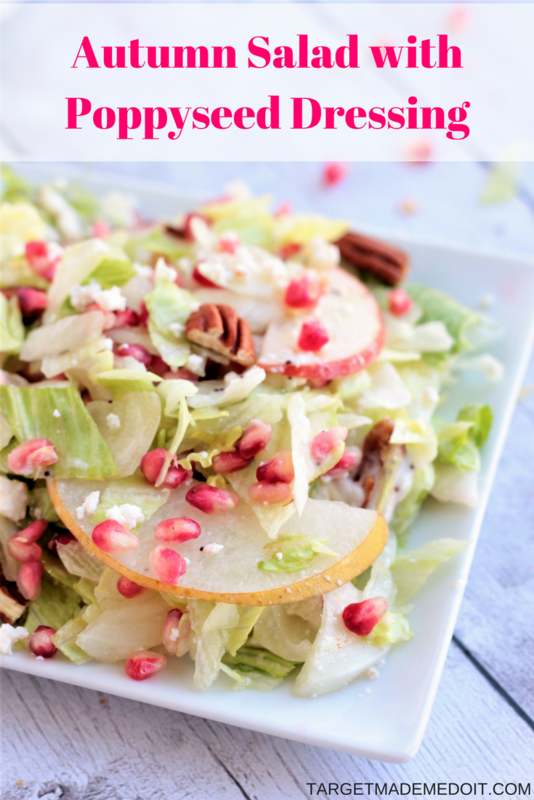 This looks like such a wonderful salad, and perfect for fall! Adding these ingredients to my grocery list! Yummm!! I love salads. Especially ones with feta cheese! This looks so delicious! I love all of the different fruits on it. What a beautiful, light and airy salad! It looks so refreshing and delicious. I'd love to try your recipe later this week. This looks super healthy & delicious. Will have to make this weekend for meal prep! 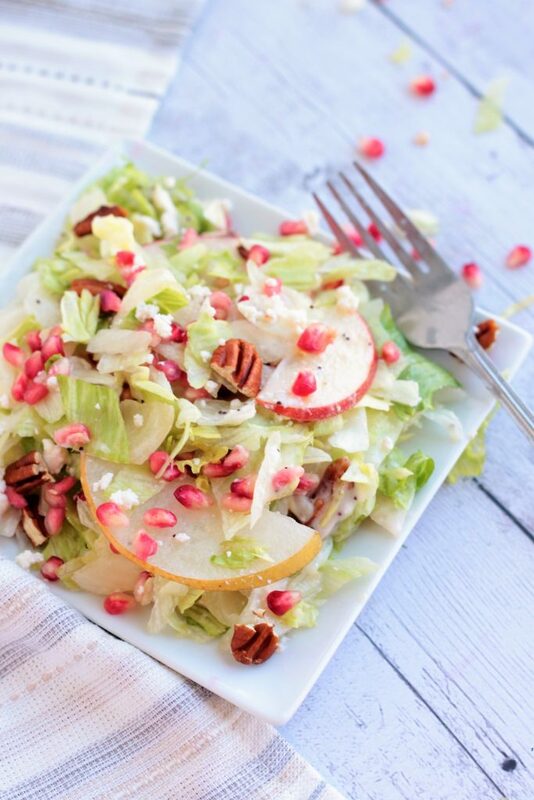 I love how fresh and simple this salad is and I love the pomengranates too. Looks really tasty. This autumn salad has me drooling!! Definitely have to try some! That is one gorgeous salad. Mine never look this delicious. I'll have to try your recipe next time, I've been wanting to try poppyseed dressing from some time. ohhh! Loving the combo! Thanks for sharing! Summertime means entertaining. There’s nothing we love more than having people over and creating memories. For our last summer hurrah, labor Day, we are going to throw a party and serve some of our favoriteRead More. You’ve heard of cauliflower rice, right? It’s all the rage with everyone following the paleo diet or those just trying to reduce carbs. 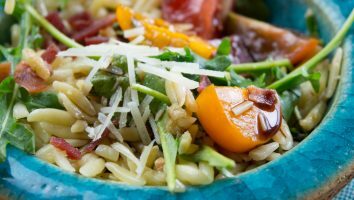 Did you know you can make a super healthy salad by includingRead More. One thing we love about this time of year? The produce is amazing! 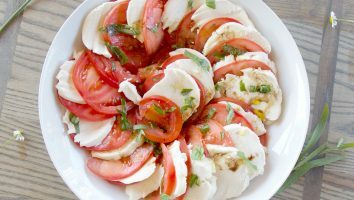 Even our pickiest eaters love to bite into a late summer grape tomato, and we can afford to get more creative andRead More. Did you hear that Target is revamping their grocery section? Every time we go there we’re eager to see the changes. You can read more about staffing improvements in the grocery section here. We doRead More. 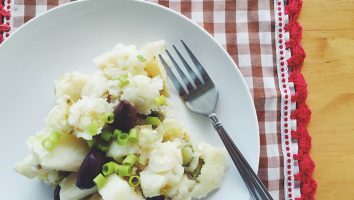 This is a great light potato salad perfect for those who like a tangy taste. It’s a potato salad vinaigrette that doesn’t use any mayo. 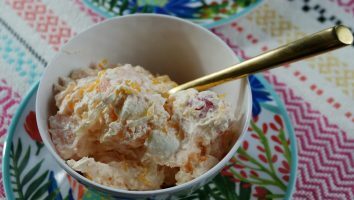 It’s a refreshing summer side dish, quick and easy toRead More. Mother’s Day is just around the corner and as a mom myself it is hard to celebrate all the other moms in my life as well as taking a few minutes for myself! I haveRead More.